Shoes for feet that are old overnight thanks to Rheumatoid Arthritis? For years, my feet were a big part of my Palindromic Rheumatism or (palindromic Rheumatoid Arthritis). I’d wake up some mornings and it would feel like I’d walked on those feet all day. It was always like I was finishing a marathon that had never started. As I described in my onset story, the first day it was only one foot, so I limped. When the other foot joined in, I crawled. It didn’t matter if no shoes fit – I could not walk. There was something like rocks inside of my skin at the base of each toe. Nothing relieved the pain, but the podiatrist made splints to try to straighten the toes and prescribed a certain shoe. Eventually, I drove the hour to the city to pick up the shoes. I went into the store in some worn out running shoes with the laces removed, over top of the splints. At the shoe store, I gave the boy the doctor’s recommendation. I tried to put on several shoes, but it was too painful to stand. He looked at me as if I had four heads on my shoulders instead of four kids wandering around his store – and a baby in a stroller. I left empty-handed, tearful, practically crawling to the car. A couple of weeks later, the feet weren’t as swollen, so I bought the shoes the doctor requested – only in a men’s size so that it would be roomier and touch my foot less. I’ve decided that the best shoe for me now that I have Rheumatoid Arthritis feet is whatever shoe is not touching my feet. What kind of shoes work for Rheumatoid Arthritis feet? I got lots of shoe advice and questions when I had to buy shoes this fall (pictured) so that I could dress like an adult and get on an airplane. Usually, I work at home in Florida. So, I don’t even have to wear socks. And I have these very stretched out super-cushy Bare Traps for ball games and the rare grocery story trips. But I keep trying to replace those since they’re loose enough now that they cause me to fall. There is not huge foot swelling nowadays because of the treatments I take for RA. But my feet continue to change and they always hurt. Finding shoes has become the proverbial search for the Holy Grail. 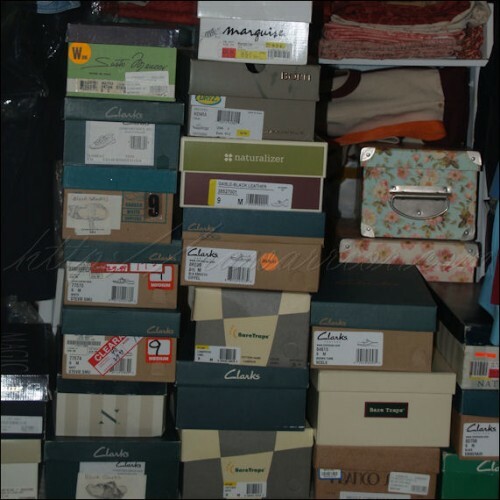 Photos: Stacks of shoe boxes in the closet have shrunk, but I keep many, hoping eventually a treatment that works for me will let me wear them again. Pictured are the shoes I managed to put on for the ACR trip. My best Rheumatoid Arthritis shoe advice is to alternate shoes each day. What is your best Rheumatoid Arthritis shoe advice? And your favorite RA shoes? Any shoe with a roomy toe box. Nothing hurts RA toes more than a cramped toe box. Aravon by New Balance makes a pretty lower heel called the Mia (and Maya), comes in widths and has room for toes and comfortable footbed. Wolky from Holland makes a wonderful adjustable sandal called the Jewel and an adjustable clog called the Cloggy. Other shoes with roomy toe box: Dansko, Sanita, Clark’s Unstructured, Merrell, Keen, Birkenstock and a few Naot styles. Although until recently my RA was not severe once the meds kicked in, I’ve never been able to wear a heel again. My knees and my toes can’t stand it. I’ve had a lot of success with shoes made by Born. They have good support and are less unattractive than some of the possibilities. Unfortunately, they are expensive, so I make them last. Keen makes great, supportive sneakers. I love mine. Those clogs are Born. I can sometimes still find a really roomy Bare Traps – the are the squishy-est. And some Clarks still, but not for long periods. I keep hoping a med will kick in and I’ll be able to wear some of the others I haven’t tossed. Humbug on the commercial. Would love to know what kind of mattresses people would recommend. The memory foam seems like it would be good for RA but it’s so expensive (as are all mattresses). We’re getting ready for a new one and I don’t want end up with buyer’s remorse. Margaret, my own tips are here at this post and some tips / links to finding a mattress. There is a link to another sleep post at the bottom & both have comments pages with people’s recommedations. I hope this helps. Margaret, I have a Pranasleep by city mattress. It is a latex mattress, and is not hot like a tempur pedic. They are expensive, but well worth it! There is an outlet in palm beach gardens, Fl, so maybe there are other outlets. It’s like sleeping on a cloud. I agree that a latex mattress is heaven. Mine is firm & I have a thick featherbed over it. I sleep like a rock. Love ’em or hate ’em, Crocs are still the best shoe for my money. The ones designed for diabetics are roomy and have a covered toe. I can’t recommend them enough. I do have a pair of Crocs that are sandals. Not the typical style Crocs, have a pair of them and cant wear them. They hurt my feet. The sandals I can wear. Usually what I do is wear them as a slipper while in the house with a nice warm pair of socks. Not the most attractive in the world, but I am looking for comfort. Appropriate topic even for those without an RA diagnosis. I have a spinal myelopathy that causes pain from waist to toes bilaterally. Have the same shoe problem!! Had to increase all shoe sizes, and here in snow country we have need for lots of shoe variations depending on season. 90% of the time I wear sandals or clogs, and almost never laceables! Have kept all of my old shoe versions just in case, like you, but let’s face it, it’s a pipe-dream. That’s the biggest problem when I travel out of Florida – having to come up w/closed shoes. Here, I don’t usually need them since there’s not a real winter. When it’s cold, I’m in trouble. ;)So, these new shoes are my “cold weather shoes.” Not exactly snow boots, eh? This is one area in which I can speaking with knowledge. As an active outdoor journalist, I am intimately familiar with foot care in high-stress situations. I also have a boot-fitting certification having graduated from an intense 3-day footwear clinic and fitting course conducted by several podiatrists, boot makers, and insole designers. For maximum foot health, look for a shoe that fits snuggly around the heel, with enough room in the forefoot to allow your foot to flex and move naturally (avoid narrow shoes that squeeze — even a little bit — your metatarsals. Your foot needs to be able to flex and move.) One of the biggest problems people commonly make is buying shoes that are too small. Your big toe should be AT LEAST 1/2 to 3/4 of an inch from the end of your shoe. Another COMMON problem for women is heels. AVOID THEM!!!!! Elevated heels are unnatural, unhealth and lead to not only foot-health problems but knee, hip and back problems. GET RID OF YOUR HEELS. When you get shoe that fits, and works for you, toss out the cheap ‘sock liner’ insert that comes with it and insert a quality footbed (sometimes called insoles). Something like SuperFeet or — my preference after 100s of hours of product testing — SOLES (www.yoursole.com). These will help your foot maintain a neutral position when sitting or standing, while guiding you foot through normal, healthy pronation and supination during walking strides. The footbeds also prevent unhealthy over-pronation and over-supination. This is one of the most important things you can do for your feet. The sock liners that come with most shoes — even high end, high-performance running and hiking shoes — are cheap (usually just compressed paper) and actually do harm to your foot health (even for non-RA sufferers). Get a quality foot-bed and your feet will thank you. Fortunately, both SuperFeet and SOLE provide footbeds for a variety of shoe styles, including dress shoes. I wear an orthopeadic sneaker made by propet. They have velcro straps—which took me a while to get use to. I feel like a little old lady, but I am over that. Also my podiatrist made me orthotics to fit in any shoe I am wearing. My feet according to the podiatrist are improving. (yeah ok–tell that to my feet). The days of cute shoes and very importantly NO FLIP FLOPS, according to my podiatrist worse thing a person can do to their feet. I couldn’t wear them anyway, even trying to walk barefoot it painful enough. I do wear an orthopeadic sandal in the summer with my ortho inserts. So basically I suggest anyone who has not been to a podiatrist see one. Great post, Kelly! Indeed, the search for the perfect shoe is much like that for the Holy Grail. I know you and I have “talked feet” before, but I am reminded of the similarities, with the sudden onset in the feet, the permanent changes that happened in a matter of a couple of weeks, etc. I’ve found Naot and Born to be the most comfortable for me…best if you can find them on sale! They are good for skinnier heels with a wider shoebox at the toes, plus good support and supersoft materials. And they are cute! Since my problems are in the ball of the foot and the heel, plus ankles, knees, hips, low back, etc., good shoes are pivotal. I started wearing sketchers about a year ago. They cushion my feet which has helped reduce the swelling and pain I have always experienced in my feet. They are a little hard to get used because of the “rocking foward” sensation they can cause. Prior to wearing Skecthers, nothing was comfortable. I have bought and returned more shoes and have not found a comfortable in years until my hubby bought me a pair of gel sole skitchers I thought I was walking on a cloud they have just the right amout of support and very light weight although on the casual side and great for everyday Im still looking for a nice dress shoe! My Rheumatologist had me get a custom made full orthotic at the same time I was put on methotrexate.They are wonderful. The metatarsal bones (ball of the foot) had collapsed on my feet so they put a mound in the ball part of the orthotic to push my toes back to a more normal position. This really helped alot. I wear shoes all the time Merrels and Ryka sneakers (with an orthotic) in the house. For outside it is trickier. I have a variey of shoes that I can put an orthotic in, even some very low heels. But everything must have some cushioning. I like Clarks and Naot. I do tend to dress from the feet up, whatever I think I can tolerate on my feet is where I start. I was dx with RA and I just discovered this website today, so excited. I always dress from the feet up too! In fact, I even started perusing this site that way, starting with this post on shoes! I wear all the same brands: Merrell, Born, Clark’s… And just bought an amazingly comfy and cute pair of Mary Jane “trail shoes” from J-41 to wear on really rough foot pain days. The insole is like memory foam! Incredible. The secret was going up a size. I recently bought some POE “Power of Essentials” walking shoes, a whole size larger and a wide. They have two velcro straps across the top so I can loosen more if needed plus no tying! I tried these on after a day of shopping. (A word to the wise… Always try on shoes when you have been on your feet a while. It’s the best time to know if they will work) I normally wear big socks around the house and if I go out, sandals. But it has gotten cold here in FL (yea really) and I realized I needed some shoes that covered my toes. My roomie says they look like wrestling shoes. LOL But I bought a pair with silver sparkles on them so they would feel more girlie. So far, they have worked great. Margaret, here’s what works for me and was suggested by my Ortho Doc. Buy a reasonably priced mattress and top it with 3″ memory foam topper. He said, and it makes sense, that a full memory foam mattress can make it too hard to get out of bed. The 3″ topper worked best for me. I seem to get all my hot flashes at night and the memory foam also retains heat, so I added a “Hunk” mattress pad on top of the topper. Sometimes I feel like the “Princess and the Pea”. Anyhow those are my suggestions cuz they work well for me. My RA started in my feet, too. Ironically enough, I assumed I had worn a bad fitting, new pair of sandals and that’s where my pain was coming from because it was so sudden and in both feet. My quest for shoes is endless as well. I have some to realize that I can’t cheap out on my shoes, they’re worth the money. I have gravitated to Born shoes because I can wear them for long (8 hour) days at the office. Flats, of course. The inside has a nice, soft support to them. More recently, I’ve turned to http://www.barkingdogs.com as the founder of that site has RA and I think I’m going to try a few that she has mentioned she likes just to see if I can find another brand that feels “wearable”. It’s hard, I know, but I will never have pain free feet. Manageable will have to do. I too have major RA foot involvement. I used to love cute shoes but now they are impossible. The following work for me: SAS shoes, CROCS, Teva mush flip-flops, Fit-Flops, and Sketchers Shape-ups. My favs by far are the Sketchers Shape-ups. Oh my goodness, the endless search for shoes! I developed bunions quickly after my RA diagnosis, and have had surgery to correct the left one already. Finding shoes that have the appropriate “squish factor” or cushioning at the ball of the foot and are WIDE enough is such a chore! I have had some success with SAS shoes, and have several pairs that I can wear, especially their sandals, PLUS they don’t look too “orthopedic”. Many of their styles come in wide and extra wide. I have one pair of SAS closed shoes, slip-ons that are comfortable for short periods of time. Otherwise, for an outing, I wear my Brooks Ariel sneakers. I should be ashamed of the $ I’ve spent on shoes over the past few years, but the quest for comfort costs big time! My current faves are my SoftWalk clogs! SoftWalk shoes aren’t cheap, but they’re well worth the extra cash and hold up well over time! But we have about 6 months of winter that I have to wear closed shoes for, and then I switch to a pair of Birkenstock Londons with the wool socks when I go outside. They aren’t cute. Quirky maybe. But otherwise, walking is out. And that is worse. I usually buy them online—Zappos offers free shipping both ways so you can try them on at home. I’ve had wandering kneecaps for years and the dr told me to always wear shoes with arch support and avoid high heels. I mostly wear Naot and Birkenstock sandals in the summer. That’s about 8-9 months a year here in Houston. In the winter I wear some of the less ugly Birkenstock shoes and Naot has some attractive shoes. Beautifeel and Sofft make some comfortable shoes too, but my feet are not deformed. For the past year I’ve had plantar fasciitis and because I have high arches, again arch support is very helpful. I’m wearing a pair of Puma athletic shoes that have the hardest arch I’ve ever worn and they work great. I also just bought a pair of Haflinger slippers, hard sole bottom, and I’m gooey with love. I bought a felt sole version for my husband for Christmas so I don’t know how he will like them. If you go to http://www.footsmart.com you can pick your problem and the site will display shoes that should help alleviate it. And then you can buy them from Amazon or locally or wherever you can get the best price. And finally, once in a while I will wear a pair of Clark or Born medium heeled shoes to relieve some of the heel pain and I saw that recommended somewhere. However, not being used to high heels means my ankles have no stiffness – I stepped on the edge of a low curb and my ankle turned right over and I fell and skinned my knee. Only embarrassing and hard on my jeans. I know the weak ankles, Janny. Maybe the RA causes it since it came on suddenly for me too. Thanks for all the good info. While we’re complaining about our shoes, I just wanted to draw to the attention of Kelly and all of her ‘bleaders’ (blog readers) this very succinct and potent paper that was covered today in a conference session for first year medical students here at SUNY Upstate Medical University: “A Patient’s Journey-Duchenne muscular dystrophy” http://bit.ly/hgmgxK http://www.bmj.com/content/341/bmj.c4364.full It’s FREE and downloadable as a pdf (starts on page 5). It helps put into perspective the range and degree of suffering encountered by individuals throughout the world of all age groups. 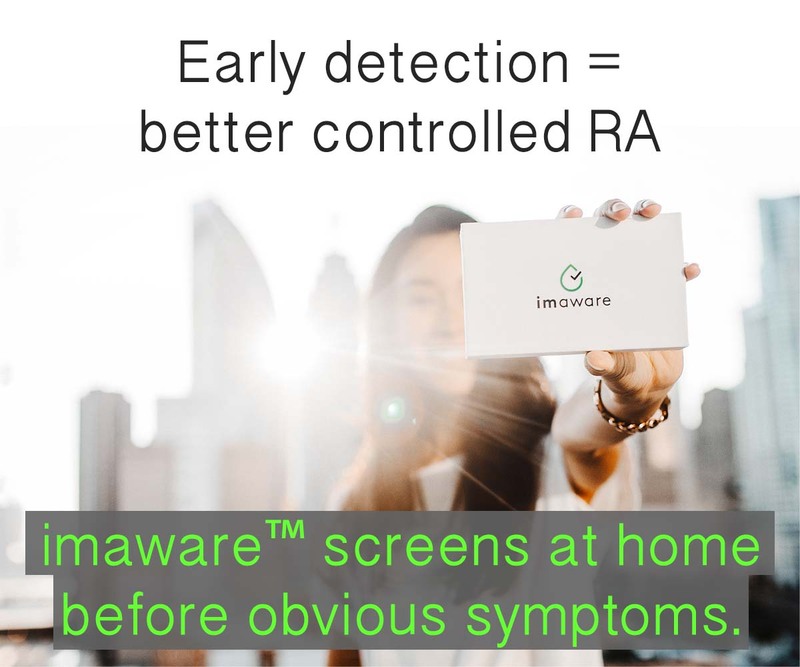 Not to detract from RA or any other single diagnosis. There’s LOTS of people suffering. It helps that there are people like those who visit this site that fully appreciate that and are there to help! I had to wear Birkenstock sandals summer and winter and between, for eight years until I had my feet reconstructed, and should have had them for all the years my feet ached. 2 pairs heavy socks in the winter Then I was able to switch to men’s wide (my feet used to be women’s 11 double A front and Quadruple A heel! )in roomy, boxy styles with velcro straps if possible. 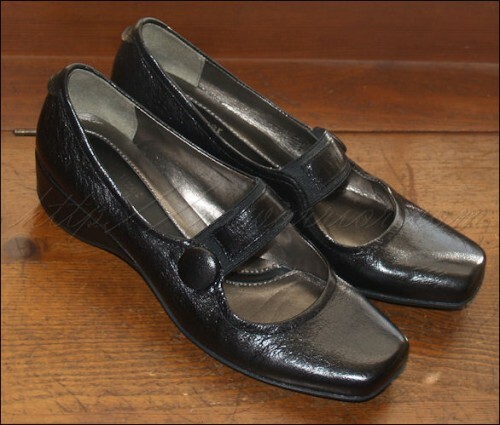 I have also found a women’s Dr. Scholl’s Mary Jane style in an 11 wide for dress-up. None of the expensive ortho shoes worked–heels too wide no matter how tightly laced or strapped. Oh, I forgot to say that after the surgery, since my re-molded toe joints were fused rather than replaced like my finger joints, I could no longer wear Birkies, or clogs when they came into style. You have to be able to grip the floor, shoe, ground, whatever to wear heel-less shoes. The best I can do for a slip-on to wear as slippers around the house are men’s deck shoes. I use gel pads in them as well as my outdoor shoes. Happy the day I found the pads! I was going to mention shoes this week! I found a pair that I can wear. Yippee! They are Easy Spirit Traveltime. Yep, the same ones that Liz just mentioned. I tried a pair of Easy Spirits that are enclosed and have a zipper. I wear a 7 but they only had an 8 1/2 left. They felt so good I almost got them! I was afraid they would stretch and then flop around. LOL I am just so happy to be out of Crocs for the winter. Last month I donated all of my other shoes to a charity. About 50 pairs. I had 7 or 8 pairs I had bought 3 years ago but never got to wear. Like Kelly my feet declined quickly. All that I had left was 1 pair of Crocs and 4 pairs of sandals. It was going to be a cold winter. I used to wear a pair of Clarks like the first picture, but since my foot surgery, I could not put my left foot in. Ah, the endless search for shoes! I did Dansko for about 8 years, with Birkenstock sandals for the short summer season. Last spring the Dansko shoes inexplicably stopped working for me. I developed tendonitis when I wore them. So with the Birkenstocks still working for the summer, I needed something for the other 9 mo. of the year. Last month I discovered Haflinger clogs… they are a Birkenstock like sole, but have a felt cushion on the footbed and heel. Also, the top of the shoe has a wide toebox, and is boiled wool, so my feet get neither too hot nor too cold. The shoe also has a more rugged sole, so I feel more stable. My foot has plenty of room and flexes naturally. I’ve also got Keen shoes and LL Bean mocs, both of which work for me short term when my feet need a change. I wear the New Balance 927 with a Rollbar because the shoe rolls right into the step and I don’t have to bend the foot as much and put pressure on the ball of the foot. In the shoes I have a full orthotic custom moulded to my feet. With them I can walk well enough to “pass” for normal. My favorite qr groundhog, dansko, keen and el natulaista for my crappy feet!! Since my left knee joint was really the affected one, though my toes and ankle did swell and it seemed like there’ll be no shoes that would fit but thank God when i started the meds, the swelling subsided and my toes and ankle were back in shape~i think…hahaha…, i have to give up most of my shoes. I also have Merrell rubber shoes and Merrell sandals. Though I do wear some heeled shoes whenever I need to but the heels are not higher than 1 1/2 inches. I don’t wear these often..only when needed as my knees are no longer used to wearing heeled shoes. I have almost given up on finding shoes I can wear. I am a lot like Lyn, I was a 10AA with quad A heel before RA. Now with RA I am in a 10 wide width with no hope for the still narrow heels. I have even had custom shoes built for me from an orthotist and they worked well for almost 3 months, then my feet changed again and shoes were no good. I need shoes to wear my short leg braces but have not found any yet. Since I am in a wheelchair full time I really do not need much support for the feet, but need a covering to go out. I wear a pair of very wore out, memory sole, sheep skin lined slippers most of the time. I even wear them when I go out except for when it there is a lot of snow. Then I wear a cheap pair of very wide Velcro sneakers. Some day maybe they can come up with a shoe that adjust to our ever changing feet!! Well, I’m stuck with Crocs – probably for good. I used to wear SAS when I was still working, but by noon I couldn’t even hobble to the cafeteria and had to have lunch brought up to my office. I had gone through Nikes, New Balance, and other brands of walking/running/aerobic shoes, and none of them worked anymore. I was miserable for a few years, wearing whatever pair of slippers or (owie!) athletic shoes. Then I discovered Crocs! Well, they aren’t pretty, but I can make them “cute” by applying Jibbitz to them. I have happy smiles, ladybugs, and (my prizes) the crests for Hogwarts Academy and Gryffendor House. I have Crocs in various colors (since I’m a Red Hatter, I have purple ones and red ones) to match my mood. Sigh! I’d KILL to be able to wear my spike heels again – the black ones with the ankle strap and the slight platform – or my hiking boots (and actually go hiking!) – or my silver or gold dancing shoes and actually ballroom dance with my husband. Deeper Sigh!! But those days are over, I’m afraid. Deepest Sigh!!! At least the Crocs don’t add hurt to my feet. Don’t necessarily make my feet hurt less – just don’t ADD any pain to already painful tarsal joints. And knees. And hips. I totally agree, Crocs are the only shoes to have for RA feet. I wrote more below. My shoe, slipper, boot of choice is something with an open back. My toes have gotten so wide that any closed shoe that fits in the toe, falls off my heel. I did find a pair of Easy Spirit shoes with an adjustable velcro back that I loved. I try not to spend too much on shoes because what fits me this week may be too small or too big next week. I did splurge on a pair of Alegria shoes ($100), but I could never wear them with a skirt or even dress slacks. They are comfortable, though. My daughter is getting married next fall and I’ve already started looking for a pair of dressy shoes to wear. Flats, of course. I feel so schlumpy. Good luck to you all. When my son got married I managed to find a pair of dress shoes that I managed to wear at the church, and then found a pair of sparkly ballerina type slippers that matched my dress with foam soles that I wore at the reception. I wished that I could wear different shoes, but was glad that I was well enough to be there as I had recently been in the hospital with a pleural effusion. Hope you have fun at the wedding! In addition to the Danskos, Borns, Clarks, etc. 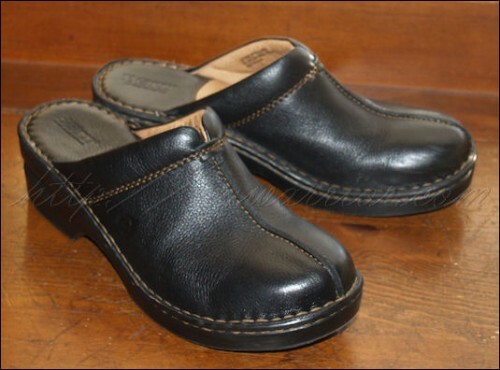 I can’t speak highly enough of my Ariat slip on shoes, which I bought very reasonably at Tractor Supply. Ariats were invented by women who wanted supportive footware for working with horses, and they also have some with rugged soles, waterproofing, and insulation for those of us not lucky enough to live in Florida. I discovered Skechers Shapeups about a year ago and wear them almost exclusively. Another brand with the rocker sole is MBT, although these are very expensive – most are $250. I did find a pair on sale for $160. I have a very narrow foot,and since none of these shoes come in narrow I get a medium width and have to wear a heavier sock with them. These rocker soled shoes have been a life saver for me, although I’ve discovered I can still overdo it and end up with sore feet. Will look into some of the other brands mentioned. OUch Candee. I didn’t know that word. But I’ve had heel pain for many years that my rheum doc told me is RA. I’ll have to ask about that. Bejewel away! That is funny – I’ve had heel pain for years that my rheum doc (my old one) emphatically told me had NOTHING to do with my RA! Haven’t brought it up with the current one yet. Reading all the comments makes me thankful that heel pain is the ONLY problem with my feet, but finding shoes I can afford and can walk in farther than from a car to a building is still a challenge. As it says in my onset story Suz – I was shocked when my first rheum doc told me that there are moveable attachments there and that pain is RA. I did have another dr roll eyes at it too, but I’ve had intense pain there since age 15 and my current doc agrees its RA too. 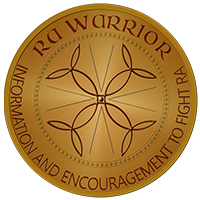 Like with the neck and the larynx and many other symptoms, there are just those who don’t know RA causes that symptom – I don’t know why since the symptoms aren’t rare. I had to have my feet totally reconstructed and it was all from RA. My tendons all stretched and my feet went totally flat and even my Achilles tendon had to be shortened. I also had my ankles fused and spent three months in a wheel chair with each foot as the bone graft healed. My toes all had to be straightened also and on my right foot the joints have been removed and my toes fused. My left 1st toe was horizontal across my other toes prior to surgery. Now I cannot walk without shoes due to pain in my heels from the screws, so I keep a pair of CROCS beside the bed…I don’t know what I would do without them!!! I live in Canada and went for years unable to find snow boots to fit my feet until I found UGGS which are roomy enough for RA toes! Recently I have found that Hush Puppy makes shoes in wide widths. 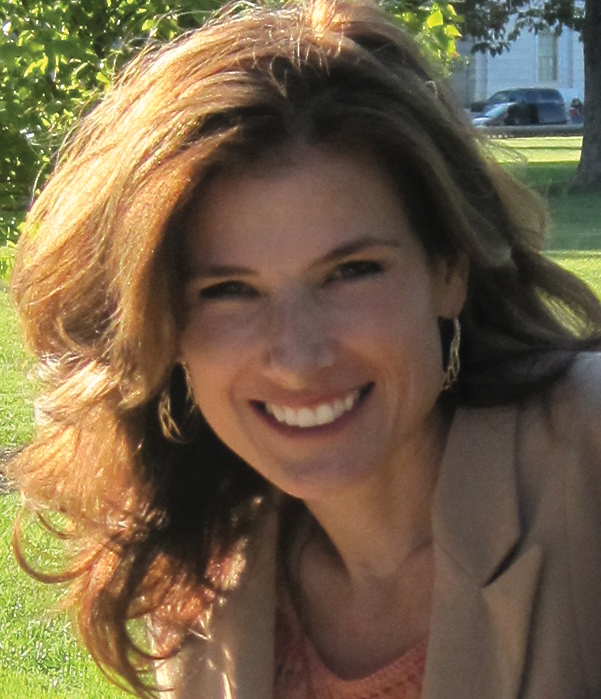 It is great that everyone can share this information and thanks Kelly for all you have done. My RA journey started in 1990 and I would have loved a forum such as this when I first became ill. I wish you did too Brenda. But I’m glad we have you as a veteran here now. We can all encourage each other. I have small, narrow feet and have had trouble finding shoes to fit for years, and most of the time had to use inserts to be able to keep them on my feet, or even to make my athletic shoes fit. Years ago my pod. had orthodics made for me to deal with my morton’s neuroma and my extremely high arch. He told me to wear only shoes with good arch support, and to ditch all my high heels and all my flats with no support. I kept my hopes up and only completely gave up all my heels after RA. I couldnit take a step in them without almost falling. A couple of weeks ago, after almost falling at church every single Sunday, I realized that all my doctors were right and that I needed to give up most of my flats as well. I am in the process of doing that. I was weepy for two days. Pretty shoes are so important for women. Even on the internet, pretty shoes that meet our requirements for support and comfort are very hard to impossible to find. For everyday wear, low heeled western style boots, LL Bean, and good quality athletic shoes work for me. I can’t wear backless shoes because they don’t keep my feet stable enough and my feet will start to roll over to the side. That’s what happened with the flats. Thanks for the info. about shoe sites. Since I am home with a broken heel bone, I just found this thread! My RA is also heavily in my feet. My feet can only handle the mens New Balance 1123 tenis shoe. Over the past ten years I imagine I have spent thousands of dollars trying various shoes. One day as young sales guy suggested the 1122’s. They are now the 1123’s. My feet turn outwards, so I am walking on the outside of my foot. Supination I think…I keep forgetting. I cannot walk without my shoes at any time. I trip over things so easily. That is why I have another broken heel. Odd place for an injury, but my feet are really sensitive, and weak. What can be done to strengthen them? Great info here. thank you! I also have men’s new balance as the shoe the doc recommended. I wish I knew what to suggest to strengthen the heel. For the bone, I bet your doc already has recommended calcium and D or a prescription for thinning bones. For the tendons, etc. that RA weakens, I do not think there is an answer unless there is a surgical repair possible. For the muscles around the heel / ankle area, I’d ask my doc for a physical therapist who has knowledge and can tell you how to safely do what you can with exercise. Poor you. Ahh, the shoe post! I’ve been waiting for this one Kelly. Thanks for giving this topic the attention it deserves. Your description of the knots at the base of your toes is VERY familiar. In addition to the bunions and knots, I live with a constant sensation of “broken feet”. The best way I can describe the foot pain is a feeling that I have kicked a wall over and over and broken all 10 toes in the process. That is the feeling that I have about 50% of the time (even with my current Enbrel treatment). Add the achilles tendonitis and plantar fasciitis – well, you get the picture. I struggle with the shoe issue on a daily basis. I work in a corporate setting, so I have to consider shoes that fit with a business casual dress code. I am very picky about style, but I finally got over the fact that my beautiful collection of heels are no longer an option. I tried to go the Sanita/Dansko Clog route, but I just can’t stand the look of those shoes on me. Plus, the open back Sanita’s seem to fall off of my foot despite the fact that the sales consultant swore that they were a perfect fit. So, I’ve resorted to ballet flats, despite the general lack of arch support. I’ve found a brand called Me Too, which have great cushioning and really cute styles. I’ve also taken a liking to Taryn Rose (found on Zappos). I think I spent the equivalent of a college tuition at my tailor’s, since I had to re-hem all of my pants to accommodate my switch from 3 inch heels to ballet flats. For winter, nothing beats my Uggs (yes, I know they have no arch support)! I have a raging case of Raynaud’s, and the Uggs are just heavenly. I now have about 4 pair that I rotate. I am a podiatrist’s nightmare patient, I suppose. Wow, I think I *need* those Ugg flip flops! Warmth and toe freedom! Thanks Kelly!! Just when I had given up on ever finding suitable shoes, I found Food Solutions. I think they’re a world wide franchise. They have 2 shops here in Dublin and the assistants really do “assist” and advise. You are amazing for keeping your shoes with hopes of one day fitting into them again. I gave away almost all of my dress shoes (they were in great shape because I only wore them in the office on carpet) and kept a few flats, sandals, and of course my trusty sneakers. Oh, did I mention that I have to buy my shoes 1 size too big so that on the days my feet/toes are swollen I can still put something on in case I have to go out? My biggest problem is that I have to wear steel toe boots at work for 12 hour shifts. I finally found the best work boot for my feet was Wolverine Durashocks a full size too large, then add a second insole in them. Extra cushion and large enough that my toes don’t touch the steel toe plates. When I’m not at work, I wear Nike cross trainers. What a great website. Wish I had found something like this when I got RA 12 years ago. I have always had problems finding comfortable shoes, but that got worse after RA. Having different size feet doesn’t help either. One shoe may be comfortable, but the other wont. I can relate to most of you. I have to wear shoes with a soft insole, good arch support, (or put in my own) and wide width. I have a pair of SAS walking sandles that I can wear for a long time. I bought a cute pair of Picolinos sandles I bought at the Walking Store. I also bought a pair of insoles there, that they try to match to you foot problem, that I use in my walking shoes. I did have to shave off part of the bottom of the arch on one insole, cause it hit wrong on my arch. They were expensive and I was glad I figured that out, or I couldn’t wear them, cause it caused the one arch to flare-up. I love my uggs again, since I found a pair of inexpensive insoles @ Walmart, I can put under the ones that come with them. I wasn’t able to wear them for a long time, as my feet got worse, because of the lack of arch support. This is something I can totally relate to…feeling like I am walking on rocks. I wear crocs or other shoes that are widw & don’t put pressure anywhere. My dr, told me to wear walking shoes, I tried them but they hurt. Luckily I was able to give my shoes to my sister. She’s got a nice shoe wardrobe now. I’m Birkenstocks all the way. I especially like the Boston Clogs in the brushed “suede” – True, this isn’t a dress up shoe, but it’s all I can manage. This means any social events are attended in slacks and my Birkies. I have to say I love my Birkenstocks. I have worn them for years. I have always had foot pain and the only shoes that don’t cause issues have been my Birks. I even bought a pair of the hard plastic ones for working in the ER. Tennis shoes cause pain when I try to push my foot into them or any kind of tie up shoes. Every year for my birthday I buy a new pair. My husband just laughs and says I’m easy to shop for on birthdays. It does help to live in Florida. We wear sandals 9 months out of the year. Anyhow…I recommend Birkenstocks of any style. Thanks, Annette. I wear sandles year round in Florida & so it gets complicated when I think of going north – or it gets cold. Haha. Hence the shopping for the shoes in the photo. Oh my goodness, how can anyone function when your feet hurt. Good shoes are a must for me. I have cronic Plantar fasciitis, plaque psoriasis, flat feet, and arthritis in both my feet. I went in to my podiatrist to get new orthotics made. He said no heels, they must have arch support since 50% of all RA people have flat feet. The tendons break down then you have real problems. He advised me to always use Crocs in the house for the support and cusioning. No fluffy slippers or barefooting – WEAR CROCS. I had never owned Crocs because I only saw the ugly things in bright colors and they were not for me. I thought, why not try them just in the house? I bought a pair in his office and put them on when I got home to try. The heavens parted and my feet rejoiced. After a few days the pain was reduced, not gone, but reduced. I wore them to do grocery shopping, I normally can’t walk much in stores, I take the electric carts do to the pain. I couldn’t believe how good they felt on the concrete. I now have 3 pair of Crocs. One strickly for in the house – the Modi Clog (so cushy), and two other pair for kicking around in. My orthotics fit perfect in them and I can find styles that aren’t the normal ugly look. You can see for yourself that there plenty of styles and colors to help your feet be happy. I am now a believer! I have been sitting here reading all these posts. I was going to pose a question, but my search for “shoes” delivered all your posts. My daughter is getting married in May this year and I desperately need to find shoes that will fit. I wore flats for my other daughters’ weddings….and I am sure I am doomed to never again wear heeled shoes. (I did try once a couple years ago…the pain in my feet felt as if a ton of bricks was dropped on both feet…excruciating!) I am going to go to all those sites you have all recommended. ouch. Poor Ruthe. Good luck with the wedding. I found “Pedora” shoes to be the best for RA. Before & after my foot surgery. You can get them on line. Although I go to an orthopedic store. I get the Mary Jane style (available only in black). It is fabric on top & has alot of give which I then insert my orthodics into them. On bad days I can also put a shoe stretcher into them over night. I did have a closet of hopeful shoes. But once after my foot surgery, I realized that dream was hopeless. So I donated 30 pairs to Good Will. Others I just threw out & now I have a clean closet. Now that’s one advantage. YeaaaH ! It’s only been one year since I’ve been diagnosed with RA, but I’ve experienced foot problems for about six years – remarkably worse over the past year.